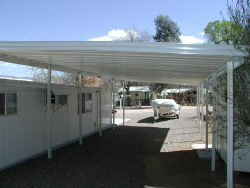 If you are planning a car cover construction project consider aluminum products. Aluminum is durable and will retain it's good looks much longer than wood covers. A car cover like the pictures below will not only be affordable but offer your vehicle lots of shade and protection. 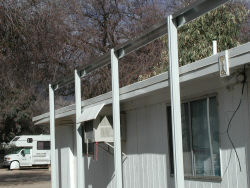 This is a freestanding aluminum awning with the ends of the panels left open to allow for snow runoff. The steel posts are buried 2' into the ground and set in concrete. The gutters have been turned upside down and used as beams for the panels to be screwed into. The awning was laid out on the ground with string and the posts marked and then dug. As the concrete was being packed around the posts a level was used to keep them straight and the edges up against the string. The clouds in the background were giving us a bit of a scare. We had scheduled one day to be out of town and complete the job. To be rained out was not in our plans. Luckily the rain held off and the job was finished as planned. Notice how the gutter was notched to fit tight against the posts and then bolted in place. 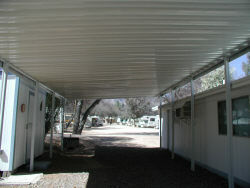 Be sure to add the side fascias at the ends of the awning. They keep the panels firm and wind resistant. They also hold the color bands that wrap around the awning and accent your home with a wide variety of colors. This is a nice view from the underside. Lots of room for a car, truck and boat. Off to the right is the mobile home. 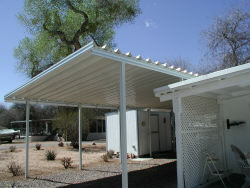 The space between the home roof and the cover can be filled in with aluminum boxed end material. It's about the same as doing mobile home skirting except it's up in the air and needs a little better support. This is a drive through cover. The boat will be pulled in and parked at this end. Great idea if you have the room. This car cover was constructed near Roosevelt Lake in Arizona. Many valley residents have property like this near a lake, or up farther into the high country, in places like Pinetop and Show Low. 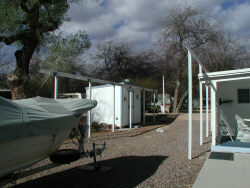 We build car covers, awnings, sheds, rooms and decks all over the great state of Arizona. We also ship our aluminum products all across the US. Please use this quote form for a no obligation estimate.